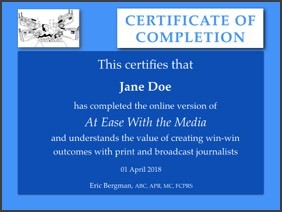 Although it can stand alone, the online version of At Ease With the Media works best as a prelude to in-person training. After completing the online program, participants are ready practice what they’ve learned. The online program consists of 10 audio-visual modules, covering a variety of topics and varying in length from four to 11 minutes. Spokespeople view the modules and complete a five-question quiz at the end of each. It takes about two hours to complete, which can be done in one session or over a series of logins. When they earn a combined score of 45/50 on the quizzes, spokespeople earn a Certificate of Completion for the program. As one participant put it: "There is content to be mastered here, which makes the learning process worthwhile." More than 1,800 people have completed the online program in English and French since it was introduced. The feedback has been overwhelmingly positive. “The online media training format encourages people to be active and engaged listeners with greater attention than otherwise might be possible by passively listening to a presentation.